Beloved folk artist Jim Shore teamed up with American institution Peanuts to create this endearing Peanuts Snoopy and Woodstock In Pumpkin Statue by Jim Shore. 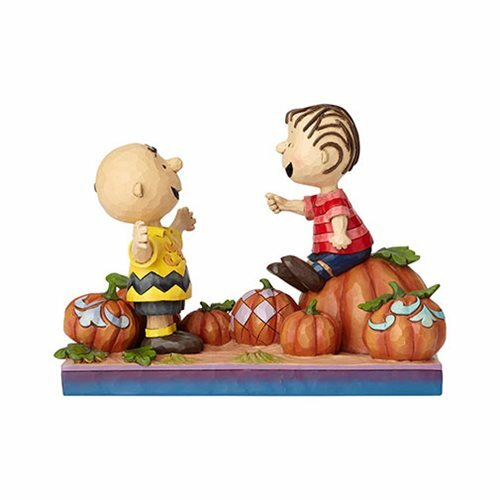 Perched on the largest pumpkin in the patch, Linus has been waiting patiently for the Great Pumpkin to appear, and now he and Charlie Brown greet each other with open arms in a heartwarming scene of friendship in the fall. This 7 3/10-inch wide x 5 1/2-inch tall x 4-inch long handcrafted design captures the heartfelt charm and nostalgic appeal of the iconic comic strip, intricately sculpted from high-quality stone resin and hand painted by a team of skilled artisans. Shore's signature rosemaling and quilt pattern details lend a lighthearted touch of color and whimsy, underscoring the cheerful mood of these pumpkin patch pals.Ages 14 and up.